The 2758 is a new 5-way binding post designed specifically for standards and precision measurement equipment applications. The binding post conducting materials are manufactured from tellurium copper and are direct plated with gold for high corrosion resistance. The use of tellurium copper instead of beryllium copper or brass, as well as gold plating with no nickel under plating ensure these posts exhibit the lowest contribution of thermal EMF. The 2758 feature nylon for all insulator materials to provide the lowest leakage and the highest mechanical reliability compared to other plastics used for binding posts. The plastic parts are virtually unbreakable and will not absorb oils and other contaminants over time that degrades measurement performance. An insertion ramp is included in the barrel to extend the life of the mating plug and post bore. Finally, careful attention to placement of metal mass within the body of the post minimizes the transient thermal EMF created by the heat from friction and from the user’s fingers while tightening the cap, minimizing the settling time after lead changes. 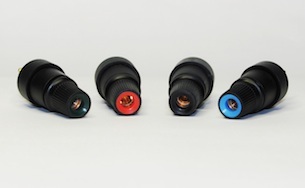 Mating terminals are also available made from pure copper and direct gold plated to match the 2758 series terminal’s performance.